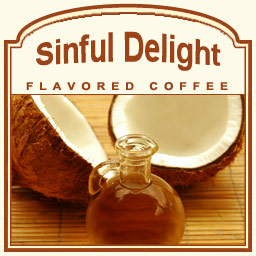 For a delicious treat, try the Sinful Delight flavored coffee paired with Jamaican Rum-inspired flavors. This Sinful Delight coffee is perfect for those with taste buds that crave a coffee filled with buttery macadamia nut and tropical coconut flavors. Nutty, sweet, and bursting with flavor, this coffee is delicious with a thick and strong lingering Arabica bean taste. A heat-sealed valve bag will ensure the freshest coffee possible, which is why we roast and ship these delicious beans on the same day. For a playful flavor that will melt in your mouth with its toasted, macadamia nut undertones, this Sinful Delight flavored coffee has the taste that will captivate your senses from the very first whiff of its aromatic scent to the very last drop of its intoxicating full-bodied flavor.